IDENTA SC Soft Relining is an A-silicone based permanently soft relining material (for hand mixing). Its autopolymerising, cold-curing properties assure that IDENTA SC Soft Relining is simple and quick to use for direct as well as indirect relining. The set contains an adhesive liquid to achieve a good bond between denture and relining material, the original relining material as well as glazing base and catalyst for smoothing rough surfaces. 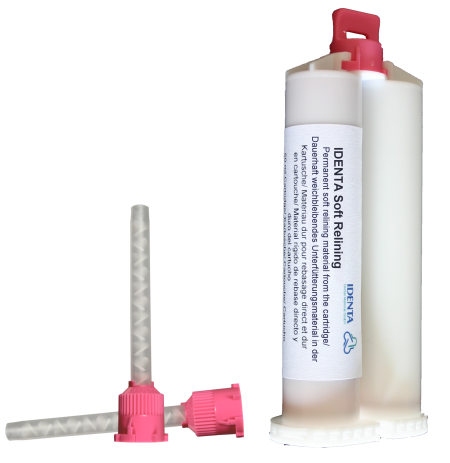 IDENTA SC Soft Relining is suitable for all PMMA-based dentures. A fresh relining with IDENTA SC Soft Relining can be repaired and corrected.